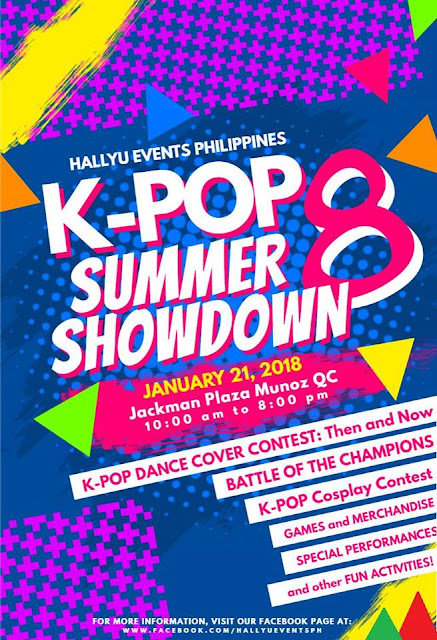 Hallyu Events Philippines brings you a fun early summer event. This isn't just an ordinary event, it's an event where challenges are made by your favorite cover groups to go against last year's champion! One of the events' highlight is the THEN and NOW where your cover group can perform your favorite idol groups songs from debut to present! Let's not forget the BATTLE OF THE CHAMPIONS! See you this January 21, 2018 at Jackman Plaza Munoz Quezon City from 10:00 am to 8:00 pm for our biggest event comeback. We surely prepared a lot this time.